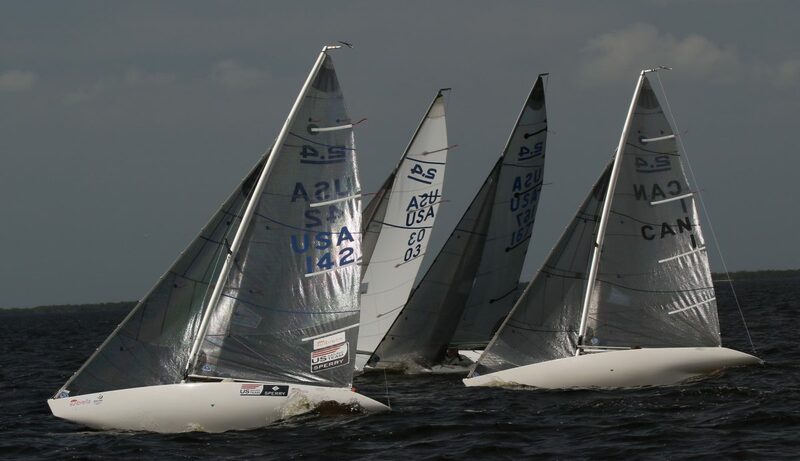 The 2018 US 2.4mr Nationals were hosted by the Charlotte Harbor Yacht Club December 7- December 9. This event was also regatta #2 of the 2019 2.4mr CanAm Championship series. The 2018 2.4mr North Americans were hosted by the Charlotte Harbor Yacht Club in Port Charlotte Florida. Tuesday Dec 4 saw 3 races completed in shifty light winds out of the N. Dee Smith led at days end with 5 pts (2,2,1). Bruce Millar finished the day second with 6 pts(1,3,2), and Peter Eager third with 13 pts(5,4,4). Day 2 the breeze increased to 12-15 kts from the NNE. The start area presented a challenging chop that diminished near the top of the course. 3 races were completed with Dee smith emerging as the overall winner with 7 pts (1,1,<3>). Bjorar Erickstad moved up to second with 12 pts (3,3,2), and Allan Leibel rounded out the podium in a tie for third with Bruce Millar with 15 pts. Allan took the tiebreaker finishing the regatta with a 2,2,1. NEWPORT, R.I. (June 25, 2017) – Another successful year for the C. Thomas Clagett, Jr. Memorial Clinic and Regatta wrapped up today in Newport, RI. Fifteen years ago five boats sailed in the inaugural Clagett and over the last three days of competition, twenty one boats have taken part in the clinic day and raced the 10 races.Sailors from Rhode Island, Florida, Pennsylvania, Illinois, New Jersey, Connecticut, Indiana, New York, Massachusetts andCanada have enjoyed a variety of challenging conditions while racing on Narragansett Bay. The three Sonars and 18 2.4mR’s had three races on the final day, after waiting ashore under the postponement flag until the breeze started to build from the South West.Rhode Islander Ben Hall took home first in all three of the races for the 2.4mR class and finished in the top 10 overall for the regatta. Hall, from Bristol RI, commented after racing, ” This is my first Clagett regatta and learned a lot from sailing the boat (the 2.4mR) in the MetreFest recently. I was sailing in a borrowed boat so I didn’t want to crash so I got out in front to avoid anyone.”Canadian Paul Tingley won the top prize in the larger of the two fleets, the 2.4mR’s. Tingley, who is no stranger to the Clagett or the 2.4mR boat, won a Bronze medal in Rio at the 2016 Paralympic Games in the Sonar and decided to come to the 15th Clagett and race the 2.4mR this year. In the 2008 Paralympics he won the Gold medal in the 2.4mR and has represented Canada at five Paralympic Games.”I love coming to The Clagett and plan on being here racing for many more years to come. It is the tightest racing has ever been and I had to make every race count. I’d like to thank Ben Hall for not being here the first day of racing,” said Tingley after the awards ceremony today.Racing at her first ever Clagett regatta in the 2.4mR was Barbara Galinska, from Chicago. She started sailing the boat in November, prior to that she has steered a Freedom and Sonar out of the Judd Goldman program. “It was the hardest thing I have ever done and I am hoping to do again very soon,” she remarked after racing wrapped up today.In the Sonar class the three teams left everything on the race course with very close racing and finishes for the entire 10 race series. After taking home the gold podium place in the Sonar class the team from Y-Knot Sailing, from Lake George,NY couldn’t have been happier with their results. Spencer Raggio, who is mainsheet trimmer on the Y-Knot Sonar commented, “If it wasn’t for the Clagett and the Clagett Boat Grant Program we wouldn’t be here. The help from everyone to get the Sip and Puff steering system operational has been amazing and to have Dave steer the last two days with the system has been fantastic. We have had great competition from the other Sonars with really close racing and finishes. We’d also like to thank Mike Ingham, for his coaching over the last four days, it really helped raise everyone’s game.”Closing the regatta for the 15th year, Clagett President and Co-Founder, Judy McLennan commented, ” We’ve had another successful year and I am thrilled that we have had the chance to have 18 2.4mR sailors on a Clagett start line. We will be working with the 2.4mR class on expanding the presence through the Clagett Boat Grant Program and we expect to see the 2.4mR as a class at the 2024 Paralympic Games. We are looking forward to being back in Oyster Bay at OakcliffSailing Center in August with the Clagett/Oakcliff Match Racing Regatta and being able to provide the opportunity for sailors to increase their match racing skills which they can then use in fleet racing. We’ll see you all back in Newport next June for the 16th Clagett.”The dates for the 2018 Clagett were announced with registration being held on June 20, the clinic June 21 and the regatta June 22-24 and will be held at Sail Newport, located in Fort Adams State Park, Newport, RI. In the largest fleet of the 2017 MetreFest regatta with 17 entries on the starting line, Dee Smith, US-7 dominated the 2.4mR class chalking up a perfect regatta. Not only did Smith win every race, he led at every single mark rounding. Ben Hall, US-77 placed second overall with 13 pts. and Theodore Green, US-175 finished third overall with 15pts. In Friday’s Around Rose Island Race, Theodore Green, US-175 finished second with Charles Rosenfield, US-142 (Woodstock, CT) in third. At Friday’s METREFEST NEWPORT 2017 dinner, upon accepting his Around the Island prize, Dee Smith suggested staging a 2.4mR World Championship in tandem with the 2019 12mR World Championship in Newport; his idea was met with resounding cheers from the 300+ gathered Metre sailors.